Greetings everyone!! Yes, it’s been a while…sorry about that. Been busy with life…I’ll just leave it at that. So at work, for the last couple of days, the Citrix admin has been having an issue with users at one of our larger remote sites…seems they are intermittently unable to connect to a Citrix server after being redirected by the Citrix license server. He brought me into the problem this morning once he realized the problem was only occurring at this one site. Very interesting! The Citrix admin was remoted onto a PC at the site, and he attempted to connect into Citrix. After I captured the data, I moved the file to my laptop and opened it up with Wireshark…I saw the 3 way handshake (SYN – SYN/ACK – ACK), and then some data going back and forth, but the session never started up and it timed out. Weird. I also captured a Wireshark session from my own laptop so I could see how it was supposed to work. I still could not see what the issue was…very strange. Say what????? I see a completed 3-way handshake…including the SYN/ACK from the server back to the PC (which was not in the PC capture), and another packet from the PC to the server completing the handshake…also not in the PC capture. VERY bizarre!!! Then it hit me…Riverbed!! The only way a handshake could be completed in this manner was from another device sitting in-between…and we do have that. We have Riverbed devices sitting at the Data Center and at most large remotes sites handling WAN optimization. Since no other sites were reporting any issues, then the Riverbed at this remote site must be “kinked”. So we restarted the Citrix application optimization process on the Riverbed, and that fixed everything! VERY cool…and very interesting. This took some time to figure out, but once I got visibility at both ends of the conversation, the answer was easy. Remember…Wireshark is your friend. 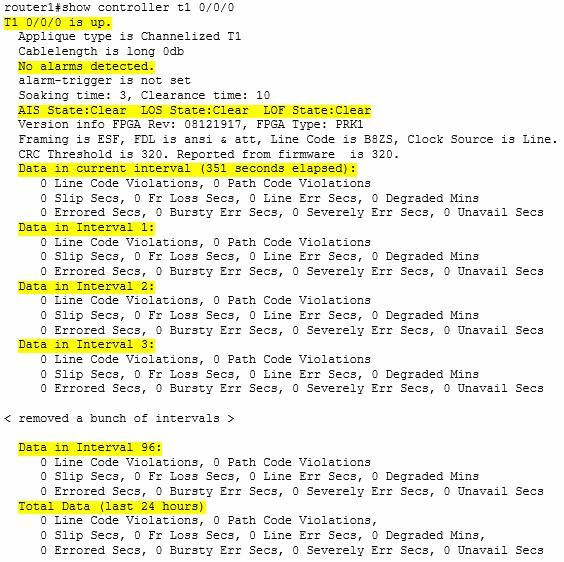 This entry was posted in Network Troubleshooting and tagged citrix, protocols, wireshark on February 10, 2016 by sr71rocks. As a followup to my post last week concerning troubleshooting a problem T1 circuit, it looks like we are finally making some progress. After working on the issue yesterday, a cable specialist was dispatched out to work on narrowing down exactly what and where the problem lies along the cable span. The carrier sent me an update stating that the LEC (Local Exchange Carrier) has: “dispatched a cable specialist who has determined there is an unbalanced signal between the last repeater in the local loop distribution plant and the customer premises”. An “unbalanced signal”….well, that’s a new one for me. But hey, as long as it gets fixed, I’m fine with that. Well, well…the circuit really is running clean for the last two hours (8 intervals). NICE!! I’ll be keeping track of this T1 over the next several days to see if the repair made by the carrier really did fix the issue. Fingers are crossed!! This entry was posted in Network Troubleshooting on February 3, 2015 by sr71rocks. The first data interval is for the current 15 minute block, and shows the elapsed time…in this case 351 seconds. After that, each interval is a full 15 minutes, and this sample shows a very clean running T1 circuit. 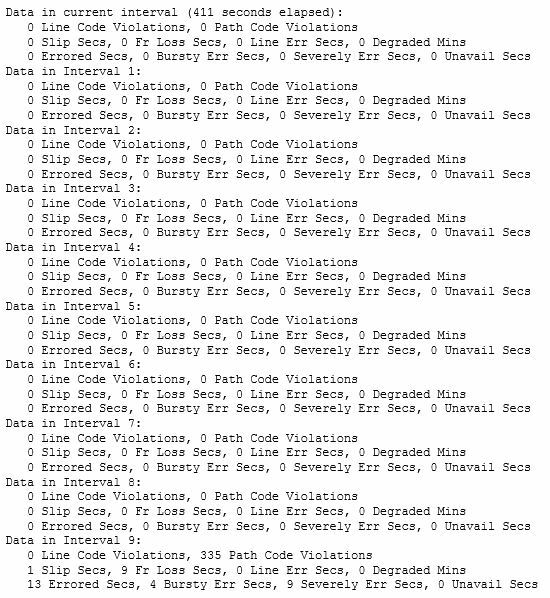 Notice the last block of data shows the summary of all errors for the preceding 24 hours (96 intervals). I sure wish all my T1’s ran this clean. A bit messy wouldn’t you say? The first 3 intervals show a circuit up and running, but VERY poorly…few, if any, applications would work properly over this type of circuit (and they weren’t, which my end customer could vouch for). Take a look at interval 17…there are 900 unavailable seconds, which is how many seconds there are in 15 minutes. So for this interval, the circuit was completely down. And notice the Total Data for all intervals…this circuit is indeed in very poor health. What does this information tell you? 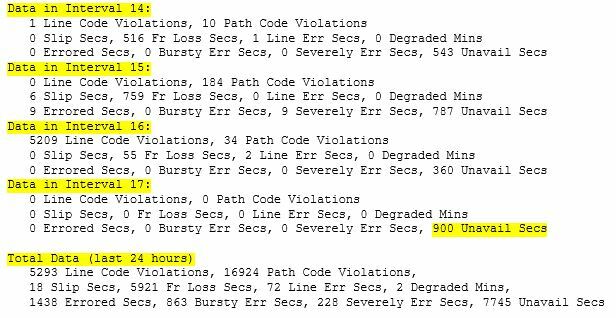 Basically, with this kind of high error rate, the problem is almost always with the carrier (issues with the cable span, NIU, or Central Office equipment). In all my years of troubleshooting T1 circuits, I’ve only had a few times where the issue was on my side (it was cabling issues with my extended DMARC usually). And remember, you can copy this information and send it to the carrier to help prove your case. This entry was posted in Network Troubleshooting on January 26, 2015 by sr71rocks. Most all networks have T1 circuits, the most common being either an MPLS T1 or Internet T1. There will be times when one of your T1 circuits will be acting up in a sporadic manner, causing “slowness” for your end users, and will require you to be more proactive in troubleshooting the root cause. This post will talk about how to stress test a T1 using PING. 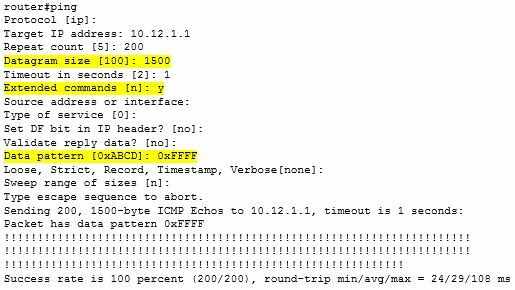 First off, understand that using a PING command with the default parameters will tell you if the circuit is up or down, and it may show problems such as large latency or excessive drops. But to really test a T1, you need to modify the use of PING to perform a more thorough test. Common actions are to increase the packet size and frequency of pings to better test throughput, and to use specific data patterns to better test the operation of the T1. 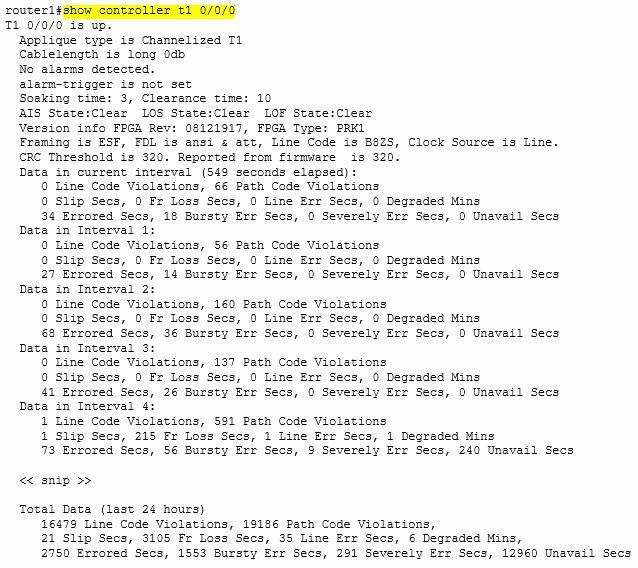 In my next post I will give an example of how I used ping flood to troubleshoot a T1 circuit whose performance was impacted by a unique problem. This entry was posted in Network Troubleshooting on November 6, 2014 by sr71rocks.